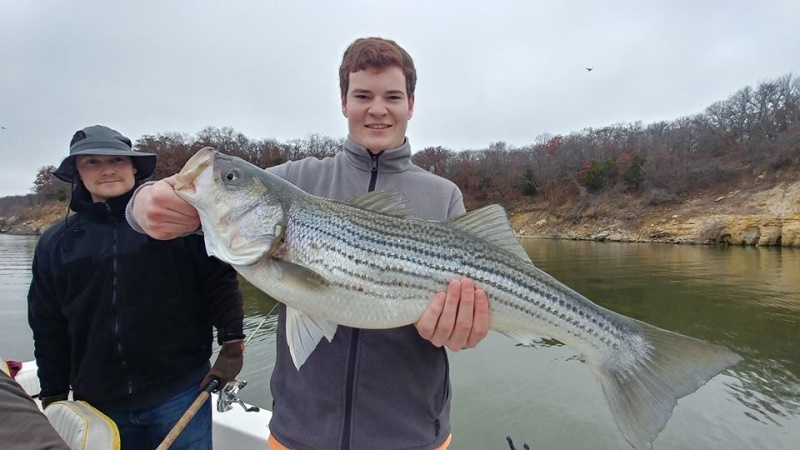 Lake Texoma Fishing Report :: Winter is Great Fishing! 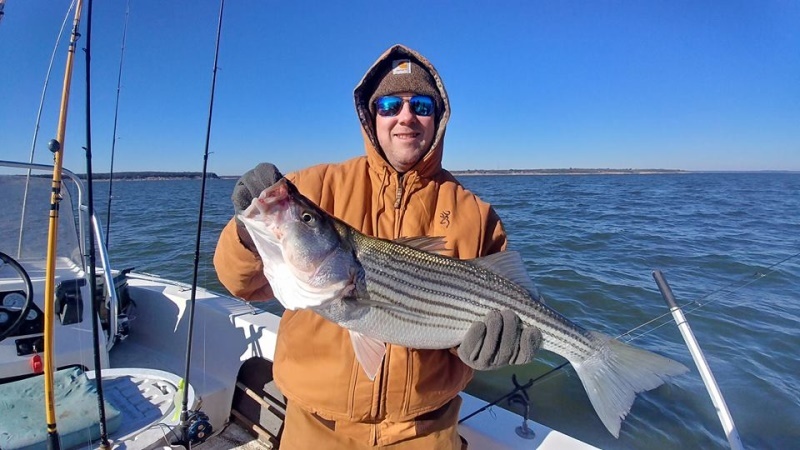 As cold weather sets in in North Texas, the striper on Lake Texoma are setteling into a new pattern which will last until early spring. Huddled in large tight schools around structure along points and ledges, these fish are not actively feeding, but when you drag swim baits and jigs through them they don't hesitate to bite and many times we may hook up with every rod as we drift through these schools to make for some exciting fishing. This type of fishing is fun and rewarding as it is how we catch some of our biggest fish of the year and load up the cooler with limits of nice fat fish. Moreover, I enjoy and appreciate this pattern above all others because it is dependable, allowing me to get into a rhythm with the fish. The fish will be in the same locations day after day and I can begin to refine the skill and finesse involved in the setup and approach needed for successfully putting folks on fish. Also, having an understanding for this pattern also allows me to easily hunt them down when they move, and with the population boom we are experiencing, the fish are not hard to find. To fish this pattern, we are finding fish in 15-40 foot of water resting along the bottom. Places where there is structure on top of structure, like a brushpile on a ledge, seem to be their favorite places to congregate. Once we find these places, I will mark them on my GPS and that way, the next time I come back, I can just setup the boat to drift over them without having to run the motor which can spook the fish. My lure of choice this time of year is a glow in the dark sassy shad which we cast out and allow to sink to the bottom before reeling in at a slow retrieve, trying to keep the lure just off of the bottom but not dragging. A change in speed or dropping it back to the bottom can help to trigger a bite. 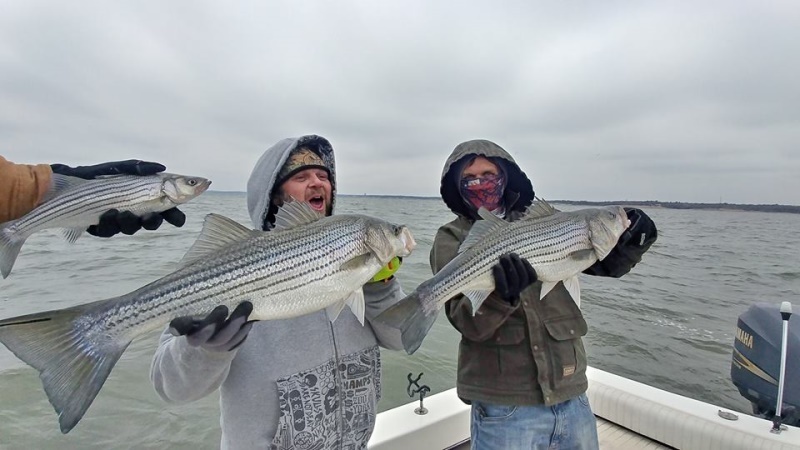 Some days we may be able to drift over the same spot over and over with the fish biting all the while and other days they will scatter after the first drift and we will make several stops along different spots throughout the trip. 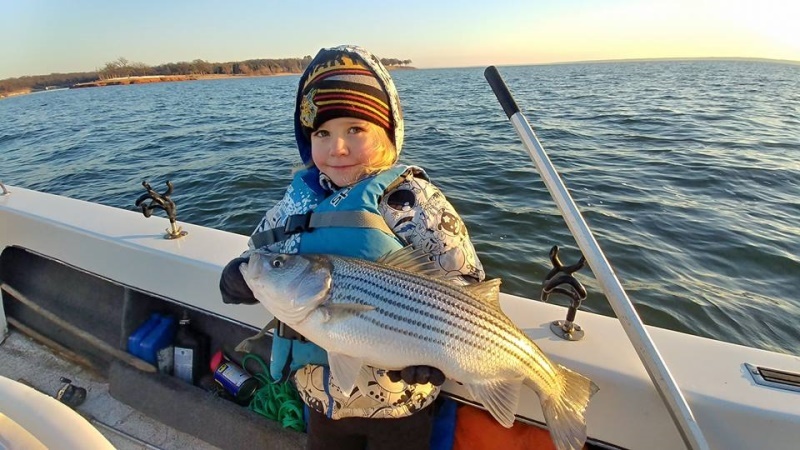 Though it can be cold this time of year, it is not necessary to get out on the water early. The fish are typically readily biting all throughout the day which allows us to fish during the warmest part of the day. My schedule is more flexible this time of year and many of my clients enjoy picking and choosing the best weather days at the last minute, after all it is Texas and if its too cold for you just wait a couple of days. Though if you schedule in advance and we find the weather to be unfavorable as the day approaches you certainly have the option to reschedule or cancel your trip if need be, there is no need to be out on the water if you are going to suffer through it, I want you to enjoy your trip. If you want to schedule an adventure out on the water with us or if you have further questions, give me a call at (903)815-1609 or visit our website to find our more information and book your trip online at www.stripersinc.com. If you have been fishing with us before, or plan to in the future, thank you! Your reviews matter to us and are important to help others to locate our service. Find Stripers Inc. on Google, Yelp, Tripadvisor, and Facebook to leave your reviews and share your stories. Your support allows my family and I to live a full and happy life and we are truly grateful.